“Love, Death & Robots” is an amazing Sci. Fi. Anthology show on Netflix. It is original and the basic concept is original and adapted science fiction short stories are done by different animators and often times adapted from stories from known sci. fi. writers. It is a beautiful anthology and tackles a lot of the popular concepts of time, personhood, self, identity, meaning, etc. that the best sci. fi. stories cover. The series overall is great, with 18 total episodes. There were some okay and good episodes too, which was why I chose this format. The great stories stand out and are the ones I want to talk about. If you are a fan of science fiction and fantasy or great animation, this is a Netflix original show, well worth your time. The series was created by Tim Miller, with himself, Joshua Doden, David Fincher and Jennifer Miller as producers. In my episode reviews I will attributing the author who inspired each story if there is one. This is partially because I want to go back and read the stories, especially since I know some of these folks from other works and want to give them credit for inspiring such an amazing show. I also won’t be giving scores this time around. Each of these stories are worlds I’d like to return to, and I feel like I can’t judge a short story in this case, the way I’d judge a movie or a full episode of a show. I also can’t wait to read them. SPOILERS ahead. I’ll try not to give away too much, but sometimes I will have to mention what makes the story work, which in short stories is often the reveal, which is what these are. Episode 8, based on story by Ken Liu. “Good Hunting” is a sad, beautiful and intriguing story that also has a sense of justice in the end. It takes place in an alternate universe where Britain conquers and turns China into a steampunk Colony. The animation is like a painting or a classic anime and I wanted to be more in this world, simply from the animation alone. It really sets the scene of China, really well. Before all this the main story involves a boy who hunts shapeshifters with his father and saves the daughter of the shapeshifter his father is hunting. They become friends and he becomes an engineer and she becomes a prostitute in the conquered China under British Rule. Both of them experience change in who they are and they talk about it together. They weren’t who they were as kids and colonization has changed not just the country but each of them. It has built the son up in regards to his engineering even though he is broken and she is torn apart. Thankfully justice happens, but so much pain happens inbetween. This is a sorrowful story, where the only bright light is the friendship between the son and the shapeshifter’s daughter. I loved it though, this story has things to stay against Imperialism, sexism and the nature of self. I can’t wait to read more of Ken Liu’s work as I loved his translation of the novel “The Three Body Problem,” by Liu Cixin. This story has that same kind of depth, which is why it made my Top 5 of the season, beyond the tragic compelling characters. Episode 3, written by Alberto Mielgo. “The Witness” was written by it’s director Alberto Mielgo and this was a story that grew on me the more I thought about it. The basic premise is two individuals caught in a time loop. Whenever one kills the other, the cycle starts over again. The dreamlike nature portrayed in the colors in the art contributes to the experience. This feels like the mixture between reality and a dream, which contributes to the point of the story. It is hard to talk about it without spoiling it because the whole premise is what makes it compelling beyond the “Blade Runner” inspired world. I could have easily spent more time here. We never get to know the characters beyond the desperation, but they are characters born out of their environment. The constant rush and tension is illustrated in the events that happen in the loop and it was impossible to pull away. I’d really like to see what else Mielgo is capable of writing. This was a great start and his world is full of untapped potential for future tales. Episode 7, based on story by Alastair Reynolds. “Beyond the Aquila Rift” was a story that almost scored lower because it repeats a song it plays in the middle of the episode. This made it feel like a musical to me, but the basic premise won in the end, especially when coupled with the almost real animation. What does it mean for an alien to care for another completely alien to it? This basic premise defines the relationship between our protagonist and the form the alien takes as a past lover to relate to him and to give him happiness, as he is in a place he cannot return from. What sold it for me, beyond this basic premise is how the reality of where he is looks like a hellscape. The tone here completely changes and suddenly the aliens good intentions don’t feel so benign, especially since one of the crew members once awakened sees past the illusion of her form. We never know her or it’s intentions though. That is why this works so well. He could be in bliss as she feeds off him to trap more people (she also looks like a spider in her true form, which adds to this) but they might have really gotten lost and truly can’t back, in which case it is giving empathy and caring in the only way it knows how and it easing suffering. This complexity is truly why this story works in the end. Episode 1, based on story by Peter F. Hamilton. “Sonnie’s Edge” is a story that is all about the twist, but it is a really good one. This takes place in a world where humans control monsters to fight each other and from it win money and fame. When Sonnie is asked to throw the game, she refuses leading to them targeting her. In the end they succeed when she takes a liking to the lover of the man who wants them to throw the game. What they don’t realize is (and I’m not sure if her crew know it or not, since we are never shown) is that Sonnie is really the monster. She is the beast in the pits always fighting for her life and the human is just her robot avatar. For me the questions that it sparked were the intelligence of the monsters (given she manipulated things to win in the end) and what that means for others like her. A lot could happen in this world, especially since at least her species is capable of controlling A.I. and making friends with humans. All this leads to her getting revenge against the people who wanted to kill her (they kill her robot avatar) and her implied escape. It is beautifully done and the reveal is perfect. The designs of the monsters are also worth commenting on. They look like Kaiju from “Pacific Rim” and it gives them a distinct character and threat. Episode 14, based on story by Alastair Reynolds. What is the purpose of life? What is meaning? This is the core question that this story asks as we learn about Zima through the eyes of a journalist. It is in this episode he tells his story as we learn he was once an early A.I. who ever countless years developed intelligence leading to him becoming the greatest artist in the world. it is fascinating how the reveal happens as the A.I. is risking everything for purpose and meaning. The final twist is a gut punch in that it wants to return to it’s original purpose in the end. The original robot was made for cleaning a pool and the symbol of the blue that kept popping up in the complex art of the universe was this robot only find peace in the simple desire to clean the pool and tiles to look like that color. As someone who loves philosophy and finds the importance of living to be a prime question, this episode is sci. fi. at it’s best. It takes that question beyond survival, love or horror (which many of the stories have above) and breaking it down to it’s base parts. Which in this instance is an immortal person with so much knowledge, returning to the basic knowledge of cleaning a pool. It is profound and it supposed to make you question. Beyond that the art is like Zima’s paintings and and fits the narrative so well. I’m looking forward to checking out Reynolds’s work. He is on this list twice and this story is truly a magnum opus. I’m going to say it one last time. If you are a sci. fi. fan, check out “Love, Death & Robots.” It is easily one of the best things on Netflix right now and I really hope it gets renewed, so we can see more stories brought to life. If you enjoyed the first season of “Stranger Things,” chances are you will greatly enjoy the second. This is a season that builds on character development, expanding the world and action. It does everything a sequel akin to “The Empire Strikes Back,” “Terminator 2” and “Aliens” did and succeeds because of it. If you haven’t watched this show yet and enjoy sci. fi. or 80’s films…check this out. I doubt you will be disappointed. The show was created by the Duffer Brothers who truly have once again done it again. The story picks up where we left off with a few months having passed. 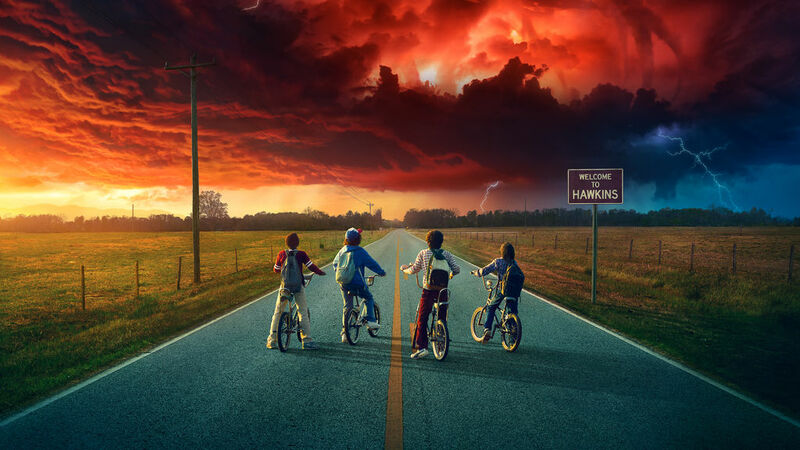 The new status quo is 11 is now living in hiding with Sheriff Hopper, Will’s trauma from the Upside Down is shown to be much more than anyone realizes and Max is a new girl in town who changes the Team’s dynamic while Nancy and Jonathan wrestle with their trauma and revealing the events of Season 1 to the world. The Pros: Cinematography and Action – I’m putting these together this time because they are somewhat obvious and don’t contribute anything substantial to how characters grow or change. These are things that really work in the context of the narrative and are an improvement from Season 1 but aren’t what stand out the most. I loved how the film looks and the action scenes are amazing, especially the action shots of the Team. So these are both positive that I wanted to state up front. The Expanding Upside Down and the Mind Flayer – One of the main arcs this season is the Mind Flayer and it’s expansion of the Upside Down. The Mind Flayer is the giant smoke creature that appears in a lot of the posters and is usually always behind a red cloud. In this the creature even possess Will, making him a spy and a way to outsmart the humans it knows it is trying to stop it. The Mind Flayer is a great enemy and a wonderful way of raising the stakes from the Demogorgon from the first film. Fathers and Those Who Become Good Fathers – Another major theme is fatherhood from our adoptive fathers of Sean Astin as Bob who is dating Joyce and helps take care of Will and supports the Team in their fight. We also see it in Sheriff Hopper and his raising of 11 and him failing until he takes responsiblity for his anger and finally as a contrast Neil who is Billy’s and Max’s abusive father. Through the film this contrast drives how many of our characters are shaped. Sean Astin’s Bob is an amazing character and you will feel for the arc he goes through. I’m glad he’s a part of this season. Mad Max and her arc – Max’s arc is finding family and standing up to her abusive brother Billy. We see this in how she stays away from the team but as they open up to her she begins to trust them and finally stands against them and defeats Billy who had been attempting to isolate her and abuse her through the show. 8 and her Team – This season we meet 8 who is another experiment who can make people see things that aren’t there with her mind. She is awesome and like Magneto she is out for revenge against the government agents with her band of punks. She’s not entirely an antagonist but she isn’t a protagonist either. This arc was good because she finds them after she finds her mother in a comatose state (that the government forced on her after stealing 11 from her) which makes 11 ready for revenge until she learns that she can’t kill out of rage, only out of love for another. 11 leaves her but we know she is still out there and I can’t wait to see her again and any other experiments who are free or exist. Saving Will – Another arc that is handled really well is saving Will. Last season set up the Upside Down was still a part of him when he threw up a slug and in this we see the Mind Flayer possess him leading to him going through hell as the Team seeks to save him. It is tough and he isn’t rescued until the end and it is a fight to get to that point. The danger and visions give a good foreboding tone through the entire season. 11 and Hopper – I love this relationship. Hopper lost his daughter and 11 is his new daughter and Hopper is 11’s new dad. They’ve both been through trauma loss and it shapes how hard it is for them to trust one another. Hopper is extremely over protective at first and 11 is counting down the days she’s been stuck away from the world being protected. It is powerful and comes to a head when she runs away and Hopper calls her finally ending in them meeting up and her reunion with the Team and Mike. The resolution is powerful and we see that her standing together with her new family gives her the power to take on the expanding influence of the Mind Flayer. The Team (old and new) – The Team is fantastic in this! You have Nancy and Jonathan revealing the government corruption, Steve and Dustin teaming up to find Dart (a baby Demogorgon), Lucas and Max and their budding relationship and Will and Mike dealing with the Mind Flayer with his mother and Sheriff Hopper as 11 joins them after she learns more about her backstory and finds 8 and her crew. I loved the new team dynamics and how all of them grew. None of these characters are the same after the events, they all grow and change and become stronger as they face their own trauma and loss. The Cons: Slow Start – The one problem that stood out about this season was the slow start. It really picks up after episode 4 but before that it has a pretty slow build. I think this pays off later on but I also think more could have been done to give us more information on the Mind Flayer and it’s influence and just how pervasive the Upside Down had become. This was the only issue for me that kept it from being perfect. This was one of the best seasons of television I’ve watched and much how “Defenders” season 1 fixes some of the problems in the first season of “Iron Fist” this does the same thing. This is a season of moving past nostalgia and dealing with consequences. This is a show that is more than 80’s movie and music references. This show faces trauma, loss and our characters grow and what they do matters. I’m not sure what is going to happen Season 3 as Season 2 ties things up rather nicely, but I I still can’t help but be fascinated by seeing how the characters grow further. Final Score: 9. 8 / 10 Perfect length, great action and characters grow. The slow start is the only thing working against it. “Bojack Horseman” Season 4 is the best season of the show thus far. It is easily one of the most depressing but it gives growth to it’s characters and reveals their brokenness in different ways. This season gives dimension and the status quo from past seasons can’t be established again, our characters have changed too much. This is the strength of the show and what really makes the show succeed over past seasons, which have also been great, but not reached these heights. The story involves Bojack missing for over a year as her rebuilds his childhood home in Michigan as we learn about his Mother Beatrice’s backstory and how she became broken and abusive. Eventually he returns back to L.A. where Mr. Peanutbutter is running for Mayor and Hollyhock comes into his life, believing Bojack to be her father. From here the story unfolds as Bojack has to face his himself as the rest of our characters do the same in their struggles. The Pros: The Power of Perspective – One of the most powerful aspects of storytelling this season is the power of perspective. We get an episode from Bojack’s point of view where we see his self-destruction from his point of view and self-hatred, we see Beatrice in her decaying mind and the last of her memory as it fades and we see Princess Carolyn dreaming about her story being told by a future ancestor telling her class about how Carolyn had got through the trouble and became a hero. Each one is sad as it humanizes these characters, even as we see them hurting themselves and those around them. The perspective from their point of view gives us an ability to empathize with them, even if we don’t agree with what they may do. Loss of Innocence and Cycles of Abuse – A major theme this season is loss of innocence and cycles of abuse, and how from it we see why people don’t trust or allow themselves close to others. Whether it is Beatrice witnessing her father’s abuse of her mother and her, her abusive husband and from that how she brings out her brokenness on Bojack which he later brings back on her from the abuse he received as a kid. This is a cycle that most of the main cast is going through but this season lazer focuses on Bojack and Beatrice as the way to show it and it is done amazingly. Integrity and Change – This is the first season where Bojack finally grows and changes, and he does it by owning his crap. We see this when he takes Princess Carolyn’s contract and thanks her for all she’s done for him and owns how terrible he’s been…we see this in how he still has a relationship with his half-sister Hollyhock after he finds her fathers and tells them about how his mother was the one poisoning her and from that they have a relationship again. He even helps her find out who her mom is, when he’d been not really looking for it because he didn’t want to lose her and just wanted someone else around so he wouldn’t be alone. Bojack owns all of this (really for the first time this series) and he grows. It is because of this he has chance to possibly be friends with Todd and others he has hurt again someday, he finally took the first steps and has changed in recognizable ways. There was so much that worked about this season and some things that I didn’t write about but will mention here, Todd comes out as asexual and finds a support group of others like him as he becomes empowered and comfortable in his identity and Mr. Peanutbutter and Diane’s relationship falls apart as their ways of showing they care about one another end up falling apart as their core personality strengths and flaws become too much. Seriously, this is a powerful season and one I’d highly recommend if you are already watching the show. There wasn’t anything that brought it down for me. “The Defenders” is the best show I’ve watched in the Defenders Universe it is a part of since “Daredevil” Season 1. The ending isn’t as good as Season 1 but the characters are more dynamic, everyone grows and even Iron Fist is made into a more likable guy. The strongest part of the show is still the side characters though and we finally have a lot of questions answered that have been hinted on through both “Daredevil” and “Iron Fist.” As far as my non-spoiler thoughts, you don’t need to have watched any of the prior shows to enjoy this one. It stands strong on it’s own and is one of the best creations to come out of the Marvel Cinematic Universe (MCU). The show was created by Douglas Petrie and Marco Ramirez. The story involves the leaders of the Hand coming together under Alexandra (Sigourney Weaver) as the Defenders (Daredevil, Jessica Jones, Iron Fist, Luke Cage) must come together to stop them and their apocalyptic aspirations for New York City, as well as finding out what it they seek at the bottom of the city. The Pros: The Action – This is a series that brings back the best of the action we saw in “Daredevil” Seasons 1 and 2. There are a lot of great action beats as Colleen Wing, the Defenders and others face off against the Hand and those they are manipulating in Hell’s Kitchen. The final fight at the bottom of the city in another world is also really cool too as well as when the leaders of the Hand face off against the Defenders. The Hand and their History – There are Five Leaders of the Hand who were exiled from K’un-Lun for seeking the cure for death and finding immortality. They find it in the bones of Dragons we discover in this and that is the substance that keeps bringing them back when they die. By the time of this series they use the last of it resurrect Elektra as the Black Sky but it does not go as planned as she kills Alexandra to take control of the group. There are 5 members of the Hand each representing a finger and area of the world, Alexandra, Murakami (who was controlling the Yakuza in Season 1 and 2), Bakuto (from “Iron Fist” is brought back again) and Sowande or “White Hat,” who has been using Harlem to recruit and Madam Gao who has been recurring through a few of the series. Learning about their exile and the reasons they went to K’un-Lun are powerful and I loved seeing them face off against the Defenders. “White Hat” and Murakami are the least memorable but Gao once again shows why she is in my Top 5 MCU Villains given her ability to survive and the tragedy of Alexandra is a nice touch as her personal desire to have Elektra as her daughter, blinds her judgement. All of them are at least interesting even if Murakami and “White Hat” go mostly unexplored. The Defenders and Coming Together – The Defenders are like a mixture between The Guardians and Avengers. You have the Captain America / Luke Cage / Star Lord leader type, you have the sarcastic damaged fighter in Rocket / Jessica Jones / Bruce Banner, you have the Child Soldier in Black Widow / Iron Fist and Drax who are shaped by personal loss and you have the Iron Man / Daredevil / Gamora in the conflicted hero trying to do good. There is a lot of overlap and I’m curious what lines you’d draw to the similarities between heroes but these were the ones that got me. 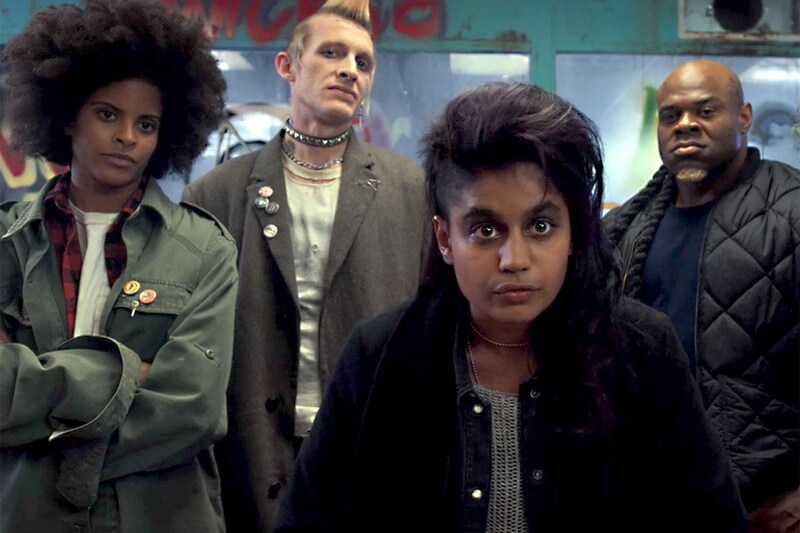 Seeing the dynamic come together on a small gritty level was wonderful and I can’t wait to see where the show goes from here and how our characters are shaped in their own shows and how that plays into their next team up, which will probably be against Kingpin. Awareness of the People of Hell’s Kitchen – There is much more awareness of the people of Hell’s Kitchen in this. From Knight and the cops calling them out on being vigilantes, in Luke Cage calling out Iron Fist for beating up scared kids who got pulled into the Hand just looking for a job to survive and how his billionaire privilege shows he doesn’t get it (as well as his race, class and name – Rand). I loved it and I hate how we don’t see this enough in Batman. Bruce Wayne is doing exactly what Iron First was put besides Alfred sometimes and Dawes in “Batman Begins” I can’t think of a time where he’s been called out. This was needed and a lot of this show is calling out Danny for his arrogance and in turn forcing him to grow and truly become a hero. This show is amazing. The Women of “The Defenders” – The women of the Defenders Universe are the best written characters on this show. Alexandra is dying of cancer but can’t let go of the world she left behind leading it to her protecting Elektra even into her death, Madam Gao is surviving and understands just how powerful the Defenders are (only Hand member who really does) Jessica Jones is working through her trauma and trust and having to work on a team and Colleen Wing is working herself through her Hand conditioning as well as doing all she can to be there for people who push her away. These women made the show amazing and are the best parts of the MCU, especially in this show. Facing Trauma – So many characters have to face their trauma in this (a running theme of the Defendersverse) with the strongest being Wing’s final defeat of Bakuto (and working through the mind control the Hand put her through) when she is trying to save Danny and blow up the building that holds the substance but we also have Daredevil confronting Stick and his abuse as well as Danny working on his own failure to save the monks. These three best illustrate this theme this season as Jessica Jones is very much doing her own thing and the trauma is so bad she has trouble being close to anyone, even friends. Okay: The Ending – The ending is okay. This is one thing that the first season of “Daredevil” has over this one as the ending involves the team moving on and Daredevil is believed to be dead (the cave collapses on him and Elektra) and when he wakes up we get hints at the show taking a darker path as everyone he knows believes him to be dead. His sacrifice was okay but we knew a “Daredevil” Season 3 was coming and no one had been set up to take up his mantel if something like this happened to him. These take away from the loss of the moment even though I did enjoy the good-byes and how the character relationships have changed because they’ve all finally interacted and grown from one another, becoming “The Defenders.” The Hand is shut down as an organization at this point though Murakami and Gao survived and both of them have the substance that gives them immortality, so I’m curious how all of that will play out, as well as Elektra’s and Matt’s future. This was the best to come out of the “Defenders” Universe and is my Second favorite Season if I put them all side by side. Season 1 of “Daredevil” is still perfection for me in this Universe but this gets most of the things right and only really falls short on the ending. It is great to see the Hand explored and truly appreciated as a threat and most importantly I loved the character dynamics between the Defenders and the members of the Hand. These character moments are why this MCU series that Netflix has created is so amazing and it is why I’ll keep coming back. If you haven’t gotten into this universe yet, this Season, like “Daredevil” Season 1 is a great way to do so. 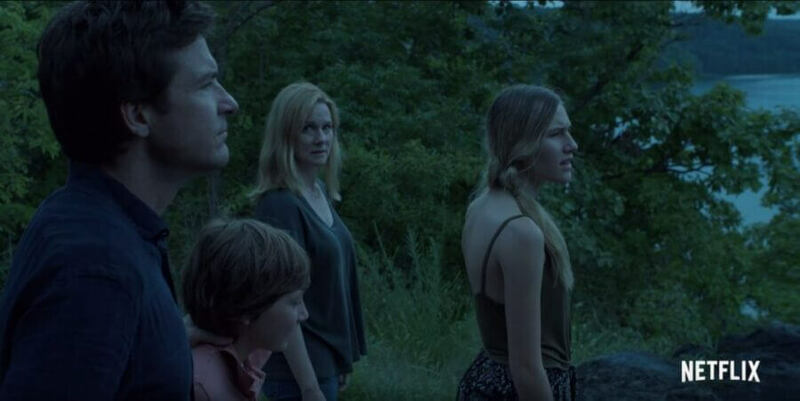 “Ozark” is a great show. This is the type of show that takes aspects of “Breaking Bad” as far as the themes of crime, redemption and corruption mixed with the threat of the FBI and the Cartel and centers it around one family, who drives the action and shapes the drama of wherever they are. This is a show I’d seriously recommend and is once again proof that “Netflix” knows how to choose the right shows to make. The series was created by Bill Dubuque and produced by Media Rights Capital. The story centers around Martin Byrde (Jason Bateman), a financial planner who ends in deep with the Cartel and must pay off his debt after his company’s money laundering scheme goes wrong. To save himself and wash the Cartel’s money he moves his family the Ozarks, but all is not as it appears to be as he upsets the balance of power that already exists as he races against time against both the FBI investigation and the Cartel. The Pros: The Price of Secrets – A major theme of this show is the price of secrets. Whether it is his wife’s affair and him holding back how long he knew about it, whether it is the truth behind the money he is investing in the Ozarks in order to have it washed and the people affected by this, or the FBI agent and his lover who by keeping in the dark leads to the destruction of his lover’s family and a failure of the initial investigation. The Art of Mutually Assured Destruction – M.A.D. is a major theme of this show as so much of it is Martin keeping different powers happy, as they know he could end them just as he knows they could end him. We see this in the threat heroin dealers who run crime area called the Snells and them working things out with the Cartel, and also the Langmores, whose father pulls the strings from prison and wants Martin’s money. The reason Wendy and Martin don’t split up after everything is they are both in on it too. They are both guilty so neither will turn on the other as both more than anything want to protect the kids. This threat that the different powers face, especially the Byrds is a huge part of what creates the drama that drives the story and Martin and Wendy’s creation of scenarios where there is some level of M.A.D. against those would harm them. The Small Push to Corruption – A major theme in the story is the small push to corruption as Martin resists his company working with Del (the leader of the Cartel in the area) until he eventually decides he wants nice things as does his wife. They know Del is dangerous but for both of them the payoff of more wins out as we see them embrace the corruption that leads up to the action that kicks off the show. The Victory of Small Acts of Good – Even with how dark the show is, there are still small acts of good. Ruth Langmore tries to kill Martin at first under orders from her dad but ends up growing attached to the Byrdes and saves them. We also see how the small acts of the family risking for one another bring them closer together. Even though things look bad at the end as the Snells kill Del and the Cartel now has them on their blacklist, their is finally love and with Ruth almost as an adopted family member now, they’ve grown and aren’t as alone and isolated as before. Okay: Del’s Ending – Del is played by Esai Morales, who played Joseph Adama in “Caprica.” He is an amazing actor and even though his death advances the threat of the Cartel and turns the Ozarks into a warzone, I still really liked his character and wanted him around, at least for another season as he was both likable and threatening, and it is hard to get that in shows like this…as even “Breaking Bad” only ever achieved it with Mike and Gus. Keeping him alive, even as a prisoner, would have made this issue a pro. The FBI – I liked the FBI agents and the fact that they were lovers, but I never felt like they had anything on the people around them. They wanted Ruth and Martin so they could take out Del but in the end they gain nothing since the Snells kill Del and Ruth never admits to trying to kill Martin and in the end the Byrde’s cover for her too. I wish they could have been more of a threat as the DEA in “Breaking Bad” feels like just as big of force as the Cartel in that show. I still thought the FBI was used okay, but as of this season, they weren’t a pro. This was another great Netflix series that I’d highly recommend. If you enjoyed “Breaking Bad” chances are you will enjoy this too as it is cut from the same cloth and tackles a lot of similar things as far as what darkness humans are capable of, as well as what it takes to get someone to the point of corruption, or to turn away from it. 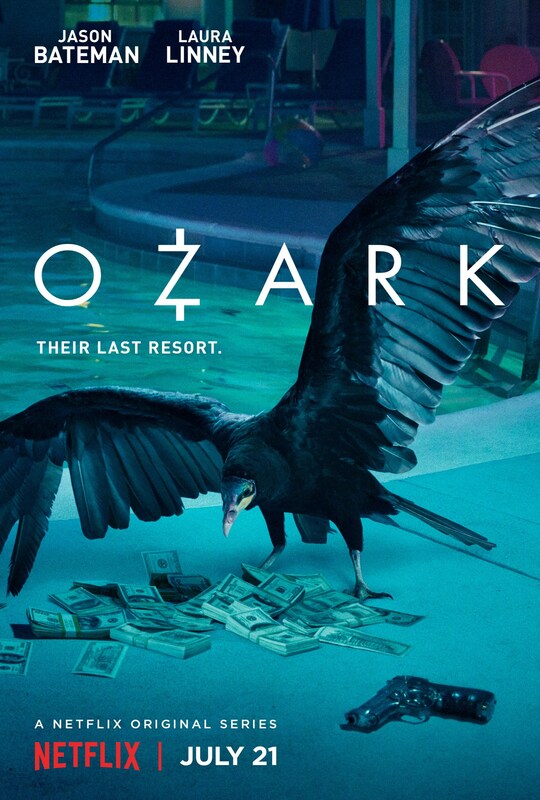 For me the main issues were the FBI arc felt incomplete (Glad they have more seasons) and Del’s ending was okay for keeping things in the Ozarks, but it should not have ended in his death. That actor is amazing and the constant threat his character brought, mixed with his reasonableness made him compelling. Lets see where the story goes from here as Del’s boss is still out there as is Ruth’s father, both of who will play a part as future threats for our protagonists. “Voltron: Legendary Defender” has yet to go wrong. Last season may have dragged a little bit, but each episode has payed off and even the moments of anime tonal dissodance are at this point gone (they were in Season 1 and 2, not 3). For non-spoiler thoughts, check out this season if you are already watching. 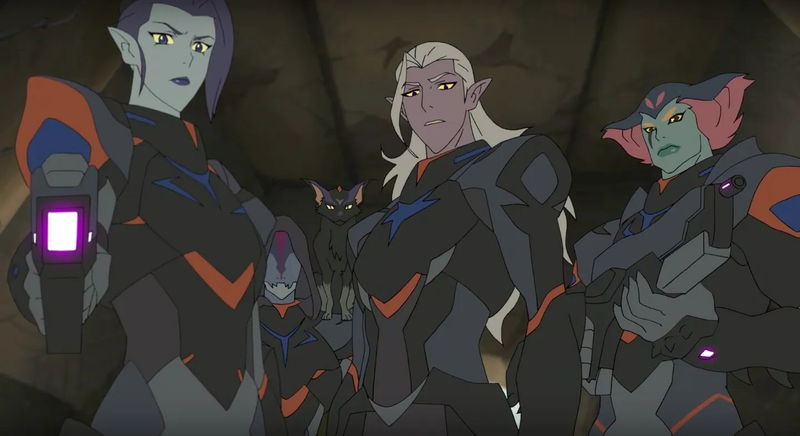 You’ll meet Prince Lotor and his amazing generals and all our heroes get some amazing development, and you’ll learn about the really cool origins of Voltron. Seriously, should check out this season. The story picks up where we left off with Shiro missing and the Black Lion needing a new leader and Prince Lotor coming out of exile to lead his people after his father has been put into a coma after the last battle. From here our heroes must find a new team dynamic and figure out Prince Lotor’s plot and stop it. The Pros: The New Paladins – With the disappearance of Shiro we have a change in the Paladins! Keith gets the Black Lion, Lance gets his Red Lion and Princess Allura becomes the new paladin over the Blue Lion. It is so cool seeing them figure things out as Keith feels inadequate and his quickness to anger is something he has to temper before they start winning battles. The Prince is always one step ahead of him too which is another issue he is always facing as Allura is also facing the change of becoming a Paladin and the new role it brings her. Prince Lotor and his Generals – Lotor and his generals are awesome! All of his generals are women and each of them is some type of rogue. They don’t really have other soldiers and they don’t need them. They capture a town without any soldiers present and show how a special elite force is better at achieving ends than a small force. Each of them is Part Galran but none of them are full blooded as far as we know, making them an outlier of the Galra Empire. His overall end is to conquer all the universes using the overwhelming power of Quintessence, at least that is the Galra Empire’s goal. Prince Lotor doesn’t kill (from what we have seen) so may have another agenda separate from that of his father and mother. Origins of Voltron – Voltron was created by Princess Allura’s father when they discover a comet from another universe that could give infinite power. Emperor Zarkon who was friend’s with Allura’s father falls in love with the alchemist who is experimenting on the substance. Eventually a creature from another universe is brought through and breaks out leading to the Lions and Voltron first being used. After this Zarkon and Alfor having a falling out until he tricks them into opening up the portal once more (the portal that is destroying his home planet). He does this to resurrect his wife who we later learn becomes Witch Haggar (She was an alchemist from Alfor’s people) they are both believed dead until the Quintessence brings them back to life and the Galra Empire makes war on the galaxy once more to gather Quintessence in order to conquer all, as the last episode ends with Haggar bringing the Emperor out of his coma too as she remembers the history that the episode recounts (that begins with Coran telling the Paladins the origins of Voltron). Okay/Cons: Too Short – I would say this was perfect season but I wanted more time with Lotor and his generals or more time with Haggar. These were missed development opportunities that only exist because the season is only 7 episodes long, when really this season needed at least 8 or 9. It is still a great season, but this keeps it from perfection. This was easily one of the best seasons of the show so far as the new enemy and team make-up gave us tons of character development and helped shape things leading into the most likely finale, as by the end of the season we know what the Galra Empire wants and how it got to be the way it is, as well as what our heroes still need to face internally in order to overcome this final challenge. This was a season that I couldn’t stop watching and is by far one of the best shows to come out on Netflix. I can’t wait to see how they wrap the story up and would watch spinoffs in this universe as the characters and politics keep me coming back. Final Score: 9.7 / 10 Would have been perfect if more time had been spent developing the Paladins and Lotor further. “Frontier” is a show whose premise I loved and whose story has a lot of potential to be extremely great. There are a few things that keep it from being great though and those are the cliffhanger ending and the main protagonist and villain just aren’t all that complex and because the focus is on them and not the more interesting characters it brings the story down and keeps it from a great Season 1. The story of “Frontier” takes place in Canada as the Kree, Americans, French, Scottish and English Hudson Bay Company vay for control of the Fur Trade in the area. 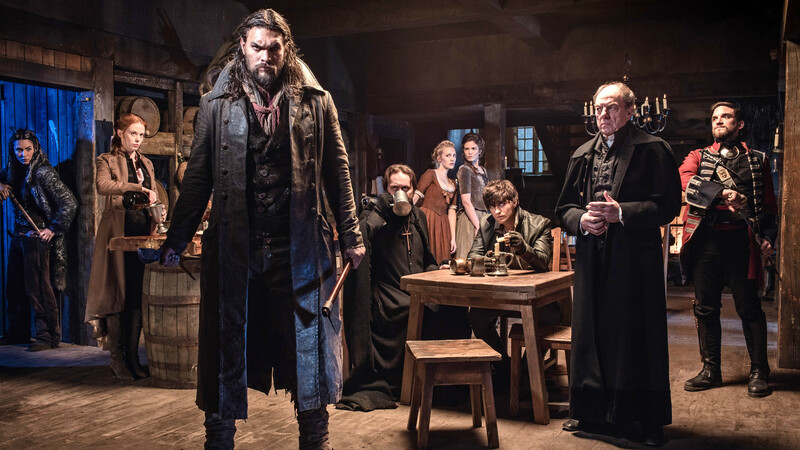 Beneath of all this the story follows Michael Smyth (Landon Laboiron) an Irishman from England who is blackmailed by Lord Benton (Alun Armstrong) into becoming a spy against Declan Harp (Jason Mamoa), a half-Kree warrior seeking revenge against Benton and the Hudson Bay Company. The Pros: The Factions – There are a lot of factions in this show and that is what makes it so interesting. You have Kree who want trade and those who want war, you have the brothers and one of the brother’s wives representing the Scots, you have Lord Benton and the Hudson Bay Company and his Captain Chesterfield who is his protector and enforcer and Grace and her Ale House which she uses to broker information and work her way into the fur trade as well, while helping Declan Harp on his revenge quest as well as an American faction causing chaos and trying to gain control over the area too. The Ale House – The Ale House is one of the most interesting places on the show as here secrets are revealed and we see it as the only true women run faction in the area after the Kree leader is overthrown by her son. Seeing them navigate a world where women are treated like dirt is fascinating and Grace is a way more compelling character than Michael or Lord Benton as she leans good but is ruthless and shows how she has survived and thrived. Declan Harp – Jason Mamoa’s Declan Harp is amazing! This is a man who lost everything to Lord Benton when his family was murdered by him after he joined the Kree and looked out for Native interests (his mother’s side of his family) and from this we see why he is so lost in revenge. This arc is still open though as in the end he escapes death (he does this a few times) but as far as we know, Lord Benton is still alive after the chaos. Okay: The Protagonist and main Villain – Michael and Lord Benton are acted well but written flatly. Benton is just a misogynistic, racist, greedy man and Michael is just the idealist boy wanting to save his girlfriend who finds a higher calling in Declan’s cause. Both of them could have been given so much more complexity. The Cons: Cliffhanger Ending – The Cliffhanger ending is really what brings the story down the most. The writer’s didn’t know if they’d get a Season 2 (Which they did thankfully) so leaving it open ended just made it so all the work and loss and fighting meant nothing. The factions are still aligned and though some maybe battered, we haven’t seen anything really change. We aren’t shown any solid change outside of Michael joining Declan over his girlfriend and even within that Lord Benton was implied to be still alive. For all the setup over the 6 episodes, there needed to be solid payoff. This is a good start to a series that has so much potential. I love the fact that we see the different reasons that different factions have for wanting to join or fight the Hudson Bay Company and how complicated the politics get as each of the faction’s leaders vay for control of the trade even as other aspects of the war blind them to that or do things that hurt their own factions cause. I’m glad this show got renewed for a Season 2, this like “Dark Matter” is another good show coming out of Canada and one I highly recommend. Final Score: 8.3 / 10 Cliffhanger and predictable protagonist brought it down but still a good start to what could become an unforgettable series.